Bambus-Lexikon: Lucky bamboo, Glücksbambus. Kein Bambus! Dieser als Bambus weltweit im Handel ist gar kein Bambus, sondern eine Yucca. Pflanze die Sie kauften, ist kein Bambus und nicht einmal ein Gras. Es shandelt sich um eine Dracaena sanderiana, auch Maispflanze genannt. Diese Pflanze soll nach dem chinesischen Glauben Glück und Segen verbreiten, deshalb wird sie auch als Glücksbambus vermarktet. Beheimatet ist diese Dracena ursprünglich in den Regenwäldern Asiens. Die Pflanze ist wie alle Drachenbäume giftig und sollte daher nicht in Reichweite von Haustieren und Kindern aufgestellt werden. Stellen Sie die Pflanze in eine Vase mit Wasser mit einigen Steinen. Bemerkungen: Dieser Bambus ist kein Bambus! Bei dieser Pflanze handelt es sich um eine Yucca-Art. Heimat im südl. China. Auch im 21. Jahrhundert wird dieser Pflanze in China immer noch Zauberkraft zugesprochen und als Glücksbringer für Reichtum, Gesundheit und ein langes Leben verschenkt. In Süd-Ost-Asien zur Dekoration und als Willkommensgruß in den modernen Hallen von Flughäfen und Bürogebäuden in vielen dekorativen Gebilden zu bewundern. Eine Kultivierung in Wasser, Hydrokultur oder Substrat ist auch an hellen Plätzen in Wohnräumen möglich. Die Blätter ähneln denen von Shibatae kumasaca, Mäusedornbambus. Ab und an stirbt eine Stengel ab und wird gelb. Bei der Massenproduktion kann keine Qualität erwartet werden! Die Gestaltungsmöglichkeiten scheinen schier unerschöpflich. Ich entdecke in China ab 2003 immer wieder neue Formen. Die Pflanzen gehören zur Familie der Liliengewächse. In tropischen Regionen ist oder waren die Pflanzen in schattigen Teilen im tropischen Regenwäldern zu sehen. Aber es ist eine schöne, untergliederte Pflanze, die gut in Innenräumen gedeiht. Mit etwas Wissen und bei guter Pflege wird der Glücksbambus auch in Ihrem Heim vielleicht etwas Glück bringen. Ihn zu pflegen, ist relativ einfach, denn er ist keine winterharte Pflanze und gedeiht in fast allen Innenräumen und Wintergärten., die nicht viel Aufwand benötigt. Lucky bamboo is what many people think of these days when they hear the word bamboo. But these easy to care for plants aren't actually bamboo at all. They are a type of plant called Dracaena, and while they are becoming popular house plants, they are actually bamboo in name only. 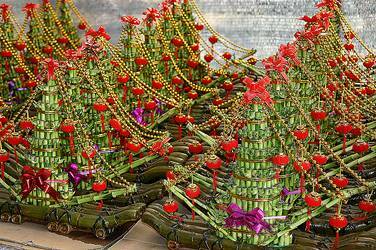 Lucky bamboo, which is known as Dracaena, Ribbon Dracaena, or Ribbon Plant, is generally classified as a shrub. This shrubby plant is from tropical West Africa, most notably from Cameroon. They grow as understory plants in the rainforests of the region, and are known for being excellent houseplants because they grow very well in indirect lighting. Dracaena or lucky bamboo usually reaches two to three feet in height for a straight piece. It also can reach between 1.5 and 4 centimeters in width if cared for properly. Curled pieces have to be specially grown that way and once they are sold, any growth that occurs on a curled piece will be straight upwards unless steps are taken to ensure that it grows curled again. Caring for lucky bamboo is very easy. Most lucky bamboo comes in a container of some kind filled with water that should be changed with spring water every week or two, and non-toxic stones much like those which can be found in fish tanks. 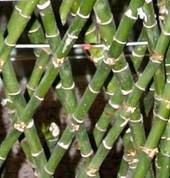 While it is suggested that lucky bamboo grows better in soil, most people choose to grow it this way for the ease of care and novelty. 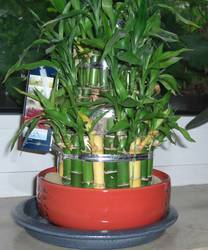 Lucky bamboo is also popular because it needs very little sunlight to grow. It is one of the few plants that will grow somewhere like an office or a bathroom, both of which are notorious for getting little to no sunlight. 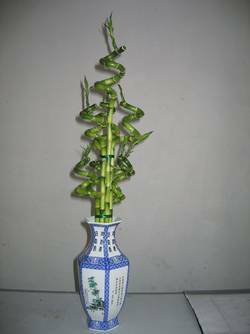 The lucky bamboo only needs indirect sunlight about once a week, and it will continue to flourish in its container whether it has soil or just water. Plant food can be given to lucky bamboo once a month so that it might reach its full potential. There are types of food out there specifically for lucky bamboo but if it is difficult to find in a particular area, lucky bamboo also responds well to aquatic plant food. 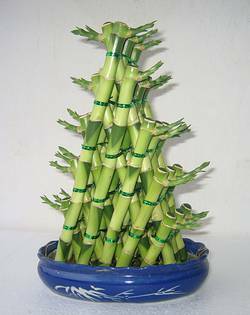 Originally just used as an ornamental plant, lucky bamboo is now becoming a popular gift for many occasions. 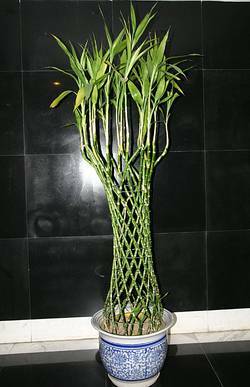 Lucky bamboo is frequently used as a housewarming gift, because the plant adds something that is easy to care for, unlike other house plants which can be difficult to care for when a family has just moved. 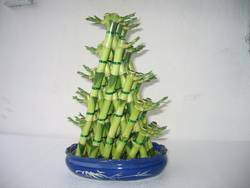 Lucky bamboo is also being used with more and more frequency for wedding favors. Because they can come in such tiny sizes, brides are choosing to have specially made little pots for their lucky bamboo favors. They are also being used as favors at other parties like bridal showers and baby showers. While lucky bamboo isn't technically bamboo at all, most people think of its curly stems and long leaves when they think of bamboo. 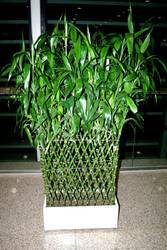 Easy to care for and growing in popularity, lucky bamboo will be a staple in many homes for years to come.